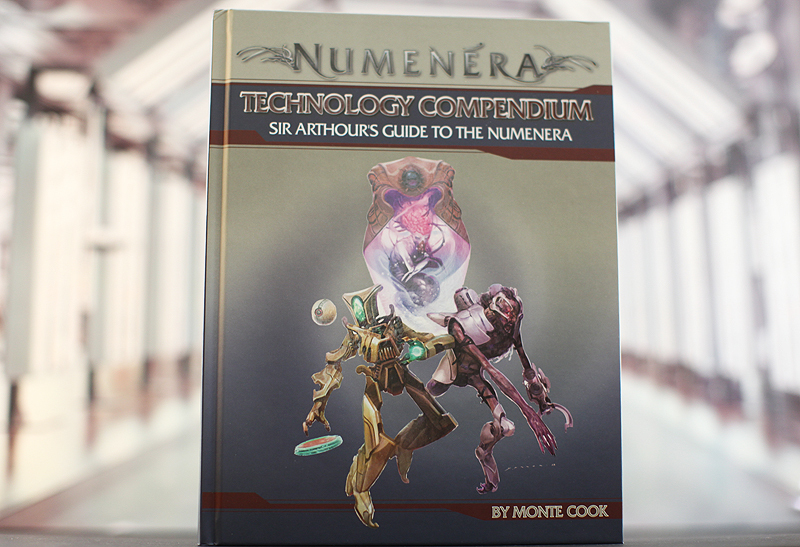 Hardback book cover of Numenera Technology Compendium – Sir Arthour’s Guide to the Numenera released by Monte Cook Games. 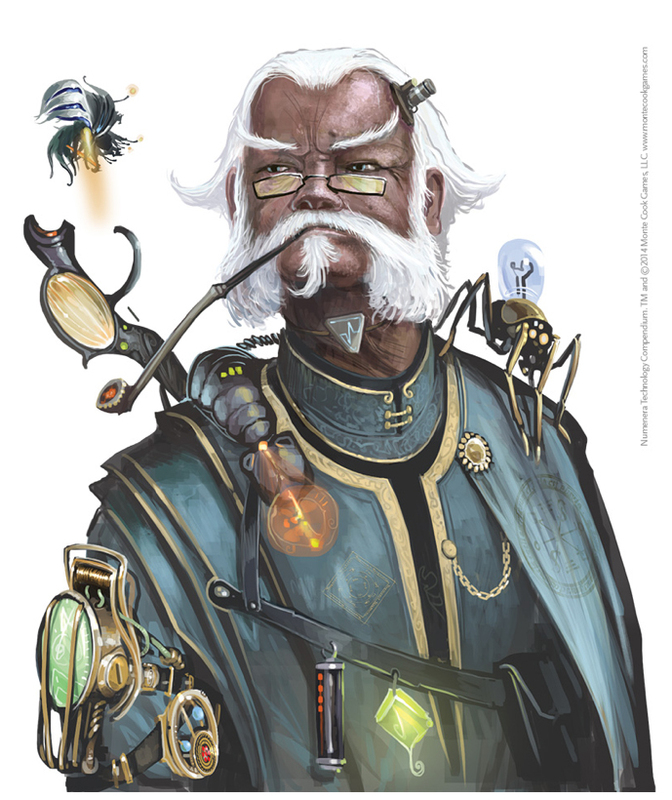 Numenera’s Technology Compendium – Sir Arthour’s Guide to the Numenera by Monte Cook is chock full of literally HUNDREDS of cyphers, artifacts and oddities; ideas behind the technology of the Ninth World, and a new descriptor where you have the option to play an automaton. The new descriptor,”Artificially Intelligent,” is made up of a very small segment in the book, but it’s a unique and interesting option players and GMs (myself included) would welcome. My favorite Monte Cook Game books so far have been the Numenera corebook, the Ninth World Bestiary and In Strange Aeons Lovecraft Numenera. I’m happy to say I can add the technology compendium to that list with its first-rate production values and Cook’s ideas. One can easily be overwhelmed with the staggering amounts of devices showcased, but thankfully a full chapter at the end of the book breaks down the gadgets by category; the description of the technology compendium boasts 400 new cyphers, 225 new artifacts and 300 new oddities. 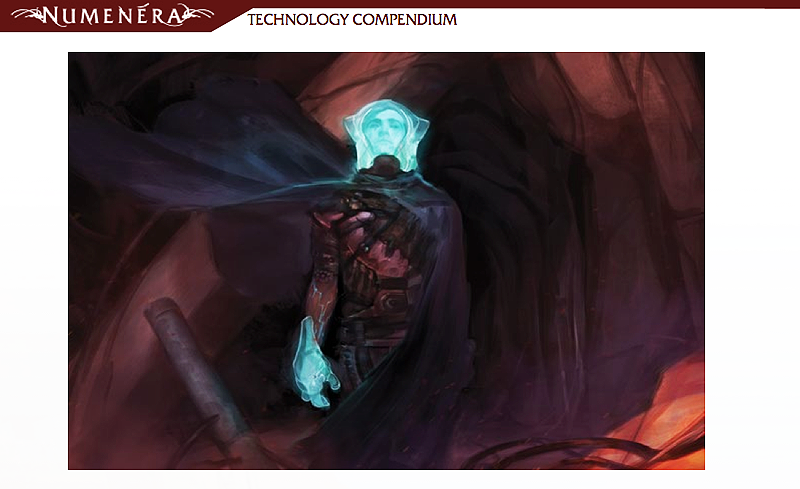 Art from Numenera Technology Compendium – Sir Arthour’s Guide to Numenera produced by Monte Cook Games. 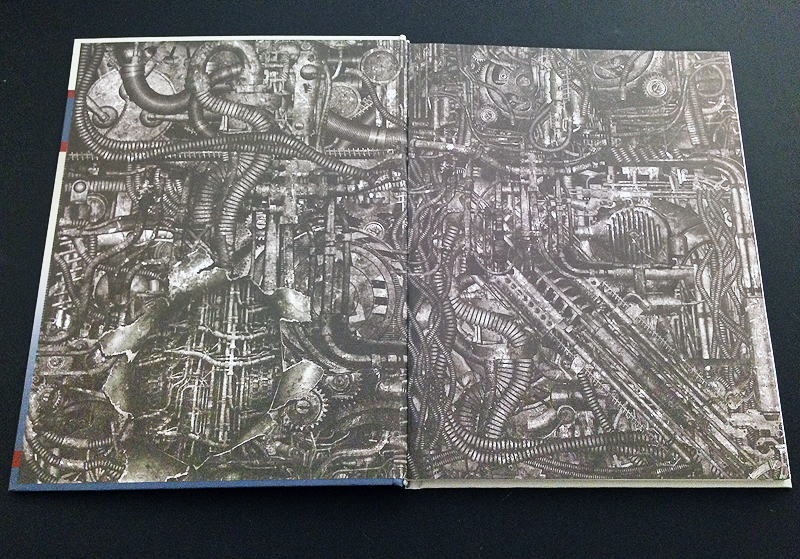 Inner book cover from Numenera Technology Compendium – Sir Arthour’s Technology Guide to the Numenera produced by Monte Cook Games. 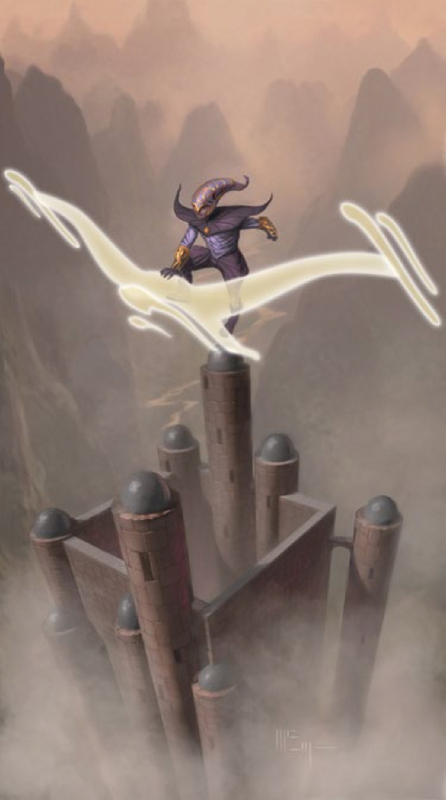 The book starts out with an introduction about the eponymous guide of the book, Sir Arthour who after a deadly and strange incident involving animated and possessed vehicles, grew up and became the first and foremost expert on numenera of the Ninth World. The chapter gives some insights and uses for nine types of technology: Electronics, Fundamental Forces, Artificial Life, Biotechnology, Chemistry, Matter, Nanotechnology, Transdimensional Technology and The Datasphere. I found this chapter helpful in that it not only details how the technology is perceived in the Ninth Age, but it also gives ideas how you could use the tech in your adventure or how the adventure itself could center on the technology. Take for example the Time technology category. Cook writes about the “Wave of Ages” where a PC brings home a strange device which slowly begins to alter those in proximity to it. Turns out the item ages living beings during certain times, or in “waves,”in close proximity to it. The Artificial Life section contains the new descriptor “Artificially Intelligent;” your chance to play a machine. The perks include enhanced intelligence, strength and speed through additions to attribute pools, with a +1 to armor. And of course you can’t get hurt by threats that damage organic beings like poisons and diseases. The other side of that is that you can’t take a pill to heal or enhance yourself; if you get damaged you’re going to have to repair yourself. My favorite part of the descriptor is the characterization, or how Cook denotes it the “Uncanny Valley,” where your character has a difficult time relating to his human compatriots, and it’s hampered by the fact that all positive interaction with “such beings” is increased by two steps. Sounds simple enough, but the idea behind it allows for a variety of role playing opportunities for both game masters and players. 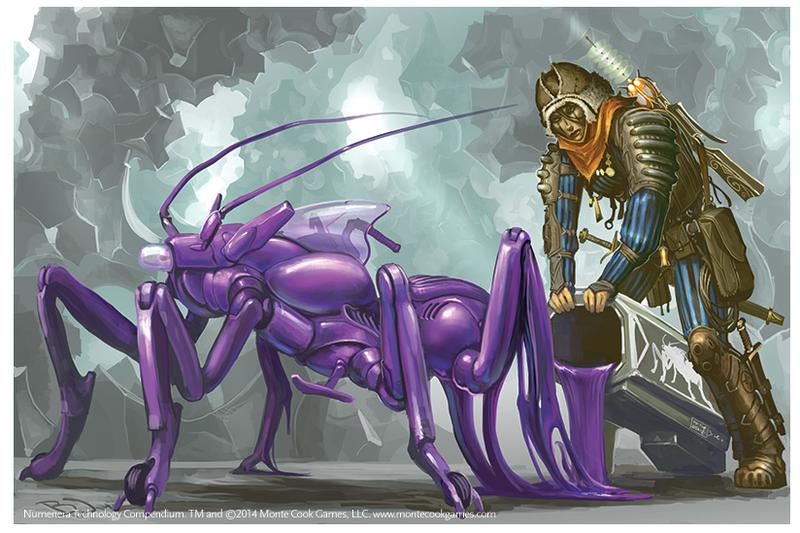 Art from Numenera Technology Compendium – Sir Arthour’s Guide to the Numenera produced by Monte Cook Games. 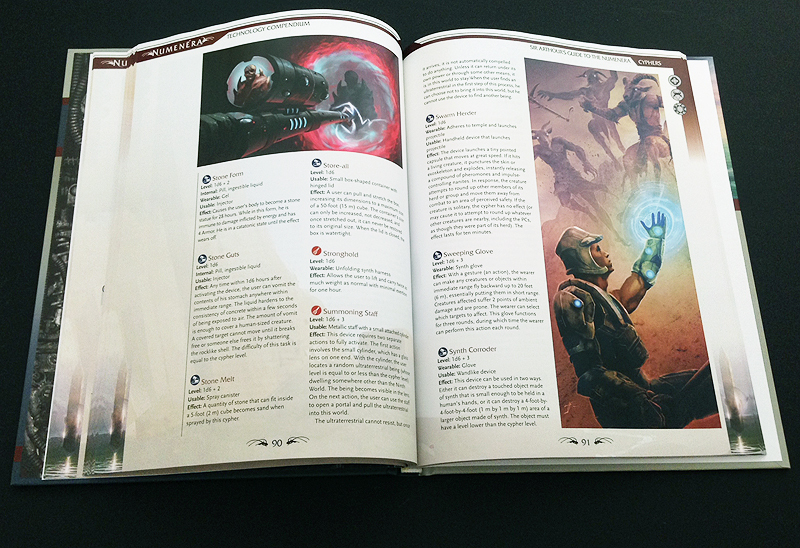 Pages from the Numenera Technology Compendium – Sir Arthour’s Guide to the Numenera produced by Monte Cook Games. The remaining portion of the book focuses on the ridiculous amount of cyphers, artifacts and oddities; you can run campaigns for years without having to come up with any numenera. A PC using “Mental Thieves” exhales a cloud of spores which invade the target’s body, locating pertinent information sought by the PC. The spores then eject themselves from the target, inflicting damage, and return to the user’s body and provides the information the PC sought. “Portable Steed” begins as a box that transforms into a steed big enough to carry two humanoids. After seven hours it shatters into 1d6 oddities. The “Spirit Call” is a metal glove that imbues the head of a dead creature “with the semblance of life.” The target can speak and is cooperative for the duration of the effect (1d6 minutes) until the last minute where it realizes it’s dead and screams for help. When I was reading through the descriptions of some of the devices I realized that not only is there a wide variety of items to introduce into your game, but like the technology chapter at the start of the book, the devices (and the ideas behind them) can be used to create plots for adventures or even elements of societies perfect for the Ninth World. A perfect example of this is “Grub Armor” which starts out as a canister of dried worms. Add a bit of water, and the worms grow and swarm over the user providing a +2 armor. Can you imagine running into an entire village whose people are covered in worms, and all of their own will? Oddities include a small marble that howls when it hears laughter, a bottle of liquid that releases bubbles that glow in the dark and a small box that projects a series of shadows…who appear to be asking for help. The Numenera Technology Compendium – Sir Arthour’s Guide to the Numenera is a book that provides you with a plethora of strange and inventive numenera to throw at your players, and like so many of Numenera’s best releases, provides new insight and ideas to further propel your games into the rich and uncanny setting of the Ninth World. 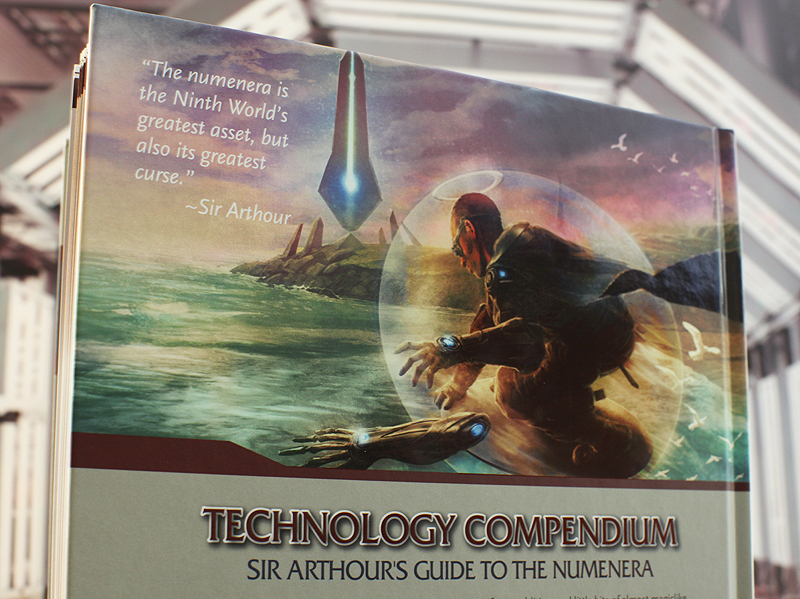 Back cover to the Numenera Technology Compendium – Sir Arthour’s Guide to the Numenera produced by Monte Cook Games.